This entry was posted in family, life writing, writing muse and tagged emotional writing, lost dads, lost dogs, the power of emotion. Bookmark the permalink. Thought-provoking essay Tom. It brought back a memory of being about 6 years old. 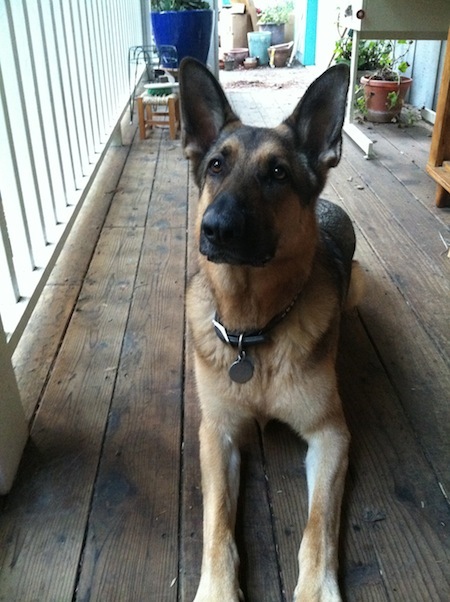 A mentally unbalanced neighbor had shot our much-beloved German shepherd, somehow thinking he was a wolf. The vet said our dog would need an expensive surgery and there was no guarantee he would make it. My dad opted to have the dog put to sleep. I don’t fault my father for this decision, but I sometimes wonder how he weighed the benefits and costs. John, your pain must have exceeded mine, because you had your dog longer, and you were much younger, so the emotion undoubtedly cut more deeply. I don’t really fault my father either, though I wish we had all tried to solve the issue together; if I recall with any accuracy (always a question), there wasn’t much shared decision-making on matters like that. Thanks for writing. Tom, my father was fairly old school when it came to parenting, and I think our economic situation was the main factor driving his decision. John, my dad could be pretty old-school himself, though he was definitely a good guy. The Depression was quite an instructor when it came to a certain way of thinking about money, especially if you didn’t have all that much to begin with. Our childhood dog, Chevy, unfortunately had her own “flaw” of falling asleep under cars on our driveway. One day my oldest brother, not seeing Chevy under his car, reversed down the driveway. Afterwards, the sound of my other brother’s anguished cries filled the house. It’s a memory of losing a pet, yes, but even more so it’s a memory of being moved and overwhelmed by the bigness of my brothers’ shared tragedy. So that’s how this post made the gates open for me, T. Bentley, and that’s a good thing because my first-kiss story ain’t all that electric. As a dog rescuer, you had me at “Harry.” I know too many sad stories to tell. You’re right about the emotions. Books that make me laugh, make me cry are the ones I remember for a long time. Annie, just to show you what flavor of morbid wise guy am I, the first thought that came to my mind was: was Chevy run over by a Ford? But forgive me that evil, and know that I understand your brother’s pain at some level, having watched my beloved kitty, Buddha, killed in front of me by a neighbor’s passing car. That was agony. Animals get deeply in our heads, and deeper yet in our hearts. Hi Aimless. Yes, good God, we are surrounded by sad stories, but once in a while there’s an uplift that happens after the sadness. I just hope for a balance of the sad and the glad stories. I’m with you on the core of books that touch us with laughs or tears; when the author can do both, with style and persuasion, I’m taken as well. I saw the photo of Hemingway’s bathroom and kitty graveyard on your blog; nice. I took a photo of a nice tribute bust of Hemingway not far from his home at Ketchum, Idaho. Mark Twain loved kitties too.